Beaterblog: Congratulations David and Tatiana, Matt and Allison! Congratulations David and Tatiana, Matt and Allison! Now that Facebook has made it official, the staff of Beaterblog would like to congratulate David and Tatiana, and Matt and Allison on their engagements. Congratulations and may your love be everlasting, like our beaters. 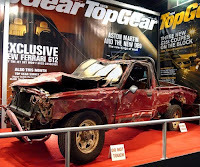 Just in case, for those who don't know, this is the indestructible Top Gear Toyota Hilux. Thanks, Victor! I'm pretty happy about it. Luckily, these ladies already know of and approve of the automotive shenanigans!